For Seniors (55 & older) only. One "Frequent Diner" stamp per single meal purchase per customer per day. Not valid with any other offer. Must present card at time of purchase and/or meal redemption. 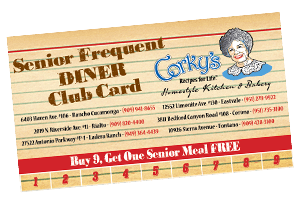 Free meal redemption valid on Senior Menu only. Sorry, No Substitutions. Avocado, Spinach, Polish Sausage and Diced Chicken.